Grand Canyon Village is a small town in Northern Arizona, situated on the South rim of the Grand Canyon National Park. Whether you prefer sleeping under the stars or in a hotel, with soft beds and running water, Grand Canyon Village is an ideal hub for all your adventures and practical activities. In addition to various historic landmarks, Grand Canyon Village itself is a National Historic Landmark District. Plus, the practical aspects of traveling are in the village, such as visitor accommodations, restaurants, grocery store, gas station, post office, ATM and more. Of course, the Grand Canyon is the MAIN attraction, but you’ll find interesting must-sees throughout the Grand Canyon Village. Launched in 1905 as a museum and gift shop, Hopi House was inspired by Hopi Pueblo dwellings in Old Oraibi, Arizona. 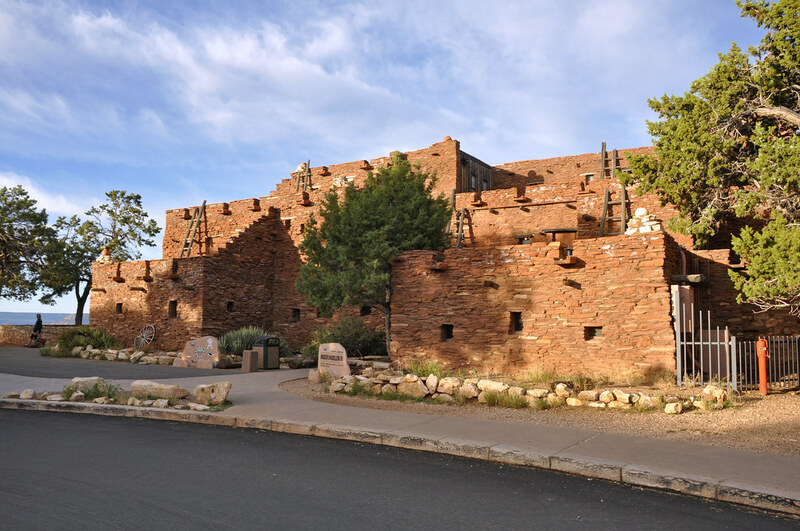 In 1987, Hopi House became a National Historic Landmark. Here you’ll find genuine American Indian arts and crafts, including handmade jewelry, Navajo rugs, pueblo pottery and Kachinas. If you visit in the summertime, enjoy the Navajo Pollen Trail Dancers performances – tribal dances and flute – on the Hopi House. outside stage. Perched precariously on the Grand Canyon’s rim, Lookout Studio is the spot for the best photo-ops of the Canyon. A must-do for visitors, who aren’t physically able to walk around the Grand Canyon, Lookout Studio provides telescopes for observing unspoiled nature at its finest. Books, specimen rocks and photos are available in the gift shop. Reminiscent of a miner’s cabin, Hermit’s Rest was constructed in 1914 as a rest stop for visitors to the Canyon. It is also a National Historic Landmark, which functions as a gift/snack shop. 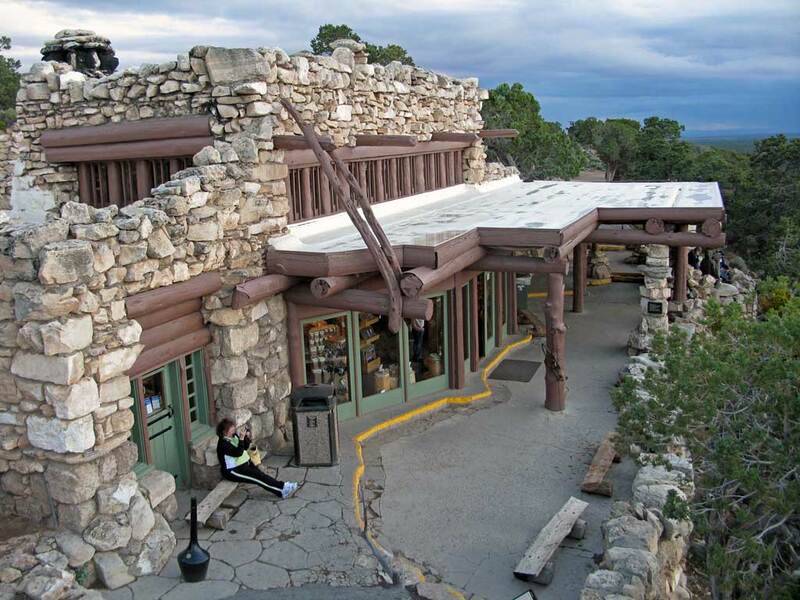 You’ll be awestruck by its massive fireplace and porch ‘resting’ on the rim of the Grand Canyon. Note: Take the Park Shuttle, as Hermits Road is not open to private motor vehicles. 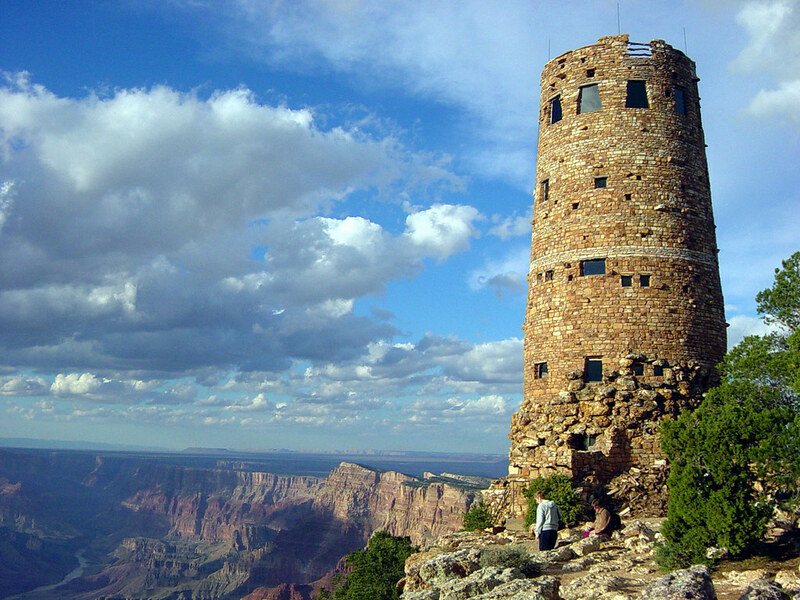 Towering 70-feet over the Canyon rim, the Desert View Watchtower provides a panoramic view of the Grand Canyon, Vermilion Cliffs and Painted Desert. Sunrise is the most auspicious time for picture taking; yet, sunset borders on the sacred, when the sinking sun radiates multi-colored hues throughout the Grand Canyon. Yet another registered National Historic Landmark, Bright Angel Lodge was erected in 1935 of logs and stone. This rustic-chic lodge was designed as a budget-friendly option to the illustrious El Tovar Lodge. 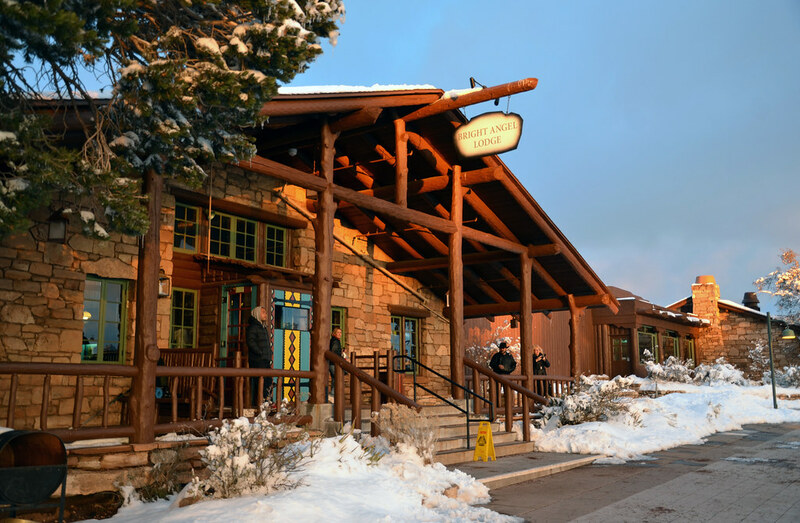 Bright Angel Lodge is more charming, but offers fewer amenities. Rooms in the main lodge do not contain TVs and you may have to share a bathroom with other guests. However, the surrounding cabins have TVs and private bathrooms. El Tovar has hosted the rich and famous, since 1905. Notable people such as Albert Einstein, Sir Paul McCartney, Theodore Roosevelt (note moose head in lobby donated by Teddy), Bill Clinton and Zane Grey have slept there. It received National Historic Landmark status in 1987. 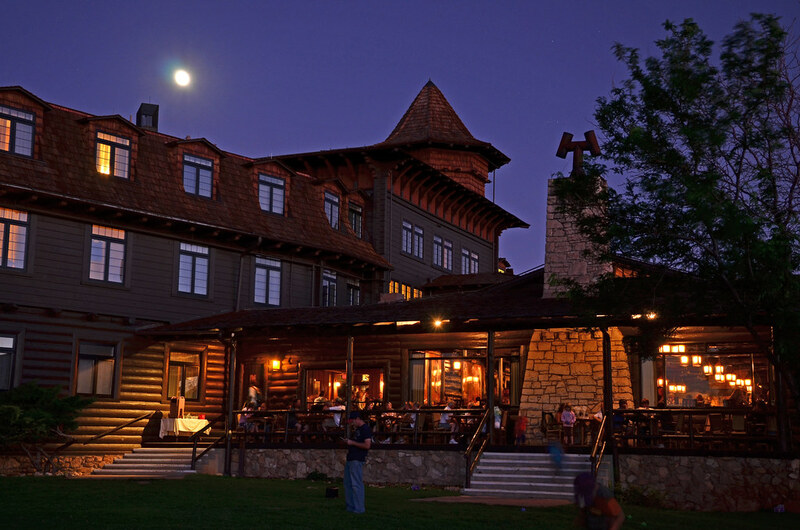 Situated a measly 20-feet from the canyon rim, the exquisite lodge is constructed from Oregon pine and native stone. Rent a bike. Take a hike. Ride free shuttle buses. Hop aboard the train. Rock it on a donkey. Whatever way you get around, just get there. The Grand Canyon is one of the Seven Natural Wonders of the World.